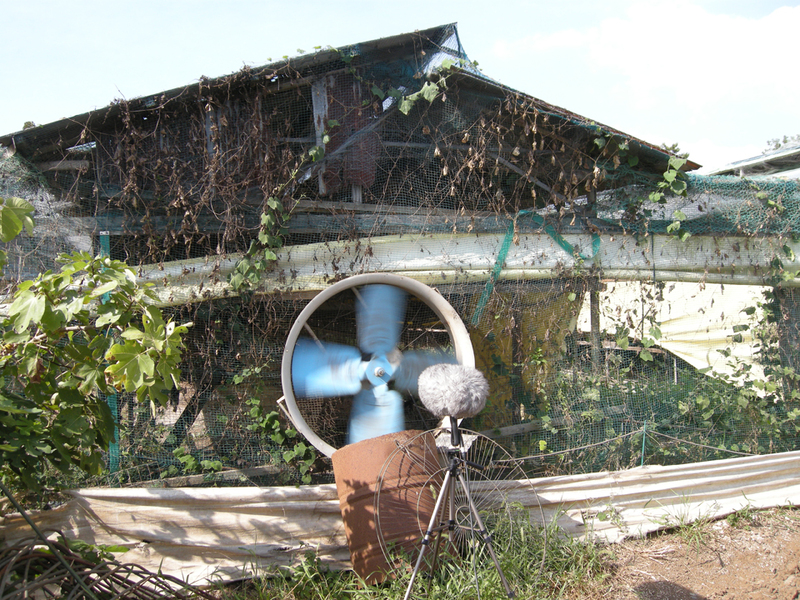 I became interested in a large fan that was used to cool the chickens in this September heat. Blue-bladed, standing some two metres across, once noticed, it becomes a small auditory presence in a particular area of the farm (north and south from the two long polytunnels and east and west between the pig sties and the stand of trees that separates the Shimamura farm stead from the small strip of municipal land). As I was trying to record the fan, spurred by the chance to mic something up close and to hear it for what it was rather than to hear it in relation to the ubiquitous jet engine noise, I began to hear another rhythmic beating sound. At first thinking this sound and artefact of the process of recording, I took my earphones off but still heard this other, grainier pulse. Peering into the back of the chicken shed I tried to see if there was another fan whose sound could be interacting with this one but couldn’t spot anything through the blue mesh that hangs down the sides. As I turned to pick up the headphones, something caught my eye: a white, sleek-nosed helicopter edging its way towards Narita City. This got me wondering whether this fan might be useful as a visual and sonic metaphor, something that could stretch out from here up to the jets and their fans, and to from this agricultural necessity to its structural neighbour the propeller. We talked at lunch to Hayashi-San, who has been helping us liaise with the family and whose work for the council in direct connection to the airport, its noise and the protests, gives him a particularly informed perspective. He spoke of the fact that not only are the Shimamuras’ organic farmers but they are advocates of the Slow Life movement in which the costs of consumer modernity should be weighed very carefully on a scale measuring ethics and ecology. He told Rupert and I that unlike many others in contemporary Japan, the Shimamuras have deliberately not chosen to install air-conditioning. Could this be another layer to this metaphor? Certainly the idea that the airport is a vital component in the enactment of what Paul Virilio calls ‘dromocracy’ – the organising of society around vectors of speed – seems an apt counterpoint to the principles of the Slow Life movement here in Japan. On a different day, Hayashi chuckled when Rupert told him that I had coined a pet name for another feature of the landscape here at the Toho farm. Whenever I see the huge steel-riveted tail fins, emblazoned with the regalia of the world’s airlines, passing slowly above the trees at the northern part of the farm or above the walls at its eastern side, I make an involuntary and now inescapable visual connection to the fin that breaks the surface of the sea in “Jaws”.